Of course, please come down to one of our training sessions and try us out! Or email us with any questions at swanseakarate(at)yahoo.co.uk (replace at with @). The Karate taught at Yoshitaka is suitable for children and adults, both male and female. Loose clothing like tracksuit bottoms and a t shirt. If you wish to continue then you may buy a white karate suit or 'gi' (we can sell you one or you are welcome to find your own). 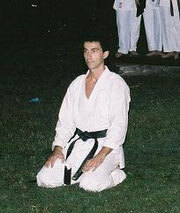 Many think that karate is about getting hit, however the emphasis of our karate is control and restraint. Light and controlled contact is the only contact encouraged. This club is certainly not about beating each other up! However it is about learning a martial art which includes etiquette and respect. Sparing is a part of our karate lessons however only once the pupil has the necessary skills to participate safely. Sparing is taught appropriate to grade and all lessons are taught with an emphasis on safety and control, and mitts are worn during any sparing at Yoshitaka Karate Club. What are the costs of karate? Compared to many activities karate is relatively cheap. The Yoshitaka Club tries to keep costs as low as possible. All that members need to pay for is the Licence (which is insurance to practice karate and is paid each year), the training session fee, which are paid per session you attend or monthly (for better savings), and if you wish to grade you will need to purchase a karate gi (suit) which are reasonably priced between £14-20 (we can sell you one or you are welcome to find your own) and gis can last for many years if cared for. Exercise can help you feel fitter and more flexible. Karate can also help you feel more confident and you are learning a new set of skills. Also club members are encouraged to grade if they wish. They are held regularly at the club and are a way of measuring ones progress within the Martial Art of Shotokan Karate and after which you gain a new coloured belt, until you are ready to take your Dan (Black belt) grade. Of course gradings are optional and Sensei will let you know when you are ready to take one. Karate is regarded as not only training your body but also your mind-and has many different and interesting kata (forms) to practice, each introducing new techniques. There is also opportunity for the karate students at Yoshitaka to compete if they so wish. Karate can develop self confidence and many people find it a fun and interesting activity! What if I have done karate before? You are more than welcome to train with us, regardless of karate style, organisation or martial art. Come down to one of our training sessions and Sensei Patritzio will advise you of the best class to come to where he can take a look at what you have done before. We are affiliated to the United Schools of Karate-Wales. Our style is Shotokan Karate and you may 'grade-in' from other Shotokan organisations. We have several current students originally from other Shotokan organisations. Sensei Patritzio will assess your karate, suggest which level class to attend and prepare you for your next grading with us, if you wish to grade with us.